SDSU fans bring spirit to first home game of the season. 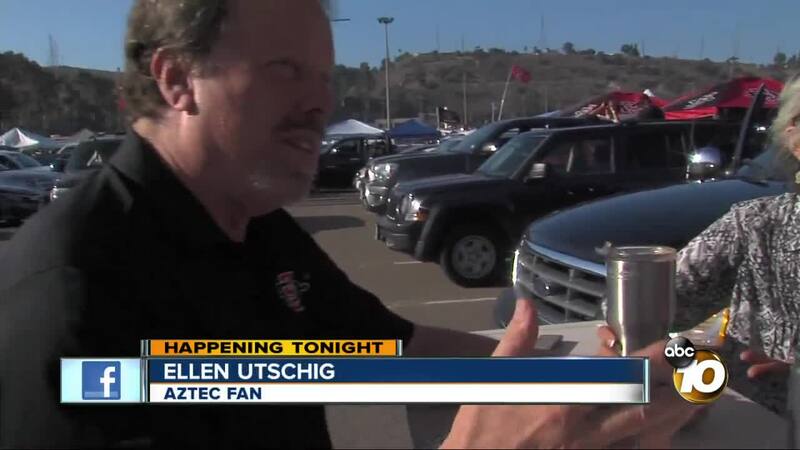 SAN DIEGO (KGTV) - Thousands of fans lined up in SDCCU's parking lot and brought out the buffets, Aztec gear, and spirit for the first San Diego State University home football game of the season. A throng of college students rocked out to music near section H3, some dancing in truck beds making the vehicle bounce. Families throughout the tailgate transformed the parking lot into their backyard with games like corn hole, picnic tables filled with food, and stocked coolers. The Parker family boasted three generations of Aztec fans, who've been brought every season since they were born. "I carried my two boys and my daughter into the Qualcomm Stadium as babies, and as we did that, now I carried my grandson over here, 16-years-old, I carried him into the game, and now I brought my granddaughter who's 6-years-old," Gene Parker said they've had season tickets since he graduated from SDSU in 1968. One group of alumni had their own bar set up. Ellen Utschig said they are alumni, "I am a KD because I thought that stood for keep drinking." "And I'm a TKE which stands for tap a keg every day," her friend Bud Conerly added jokingly. Police patrolled the tailgating area ensuring nothing got out of hand. Fans started packing up around 6 p.m. and moved into the stadium to watch the Aztecs take on the Sacramento State Hornets.